Edinburgh Evening News (EEN) recently conducted an interview with Derek Carroll, Taxi’s inventor, and the article appeared in the edition published on Saturday, 29th October 2016. Derek appeared with the game on the front page and the article then appeared on page 3 – with subsequent question related comments on page 13. If you missed it please click here to read the article. Thank you EEN for your support. 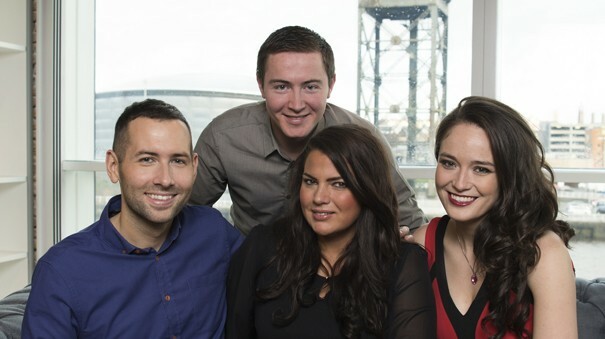 On Monday the 3rd October STV Edinburgh and STV Glasgow’s evening magazine show – Live at Five – featured a 3 minute interview with Derek Carroll, the games inventor. The interview covered the history of Taxi and the recent introduction of the Edinburgh, Glasgow and New York versions of the game. It was great publicity for Taxi and w e are grateful for all the support shown by Scottish Television. Toy News published a great article on the future plans for Taxi board game. Click here to read! It highlights the forthcoming release of Edinburgh, Glasgow and New York versions and the re-design of the London game which will all be available to retailers in late June 2016. Watch out for more Taxi news in the coming weeks. 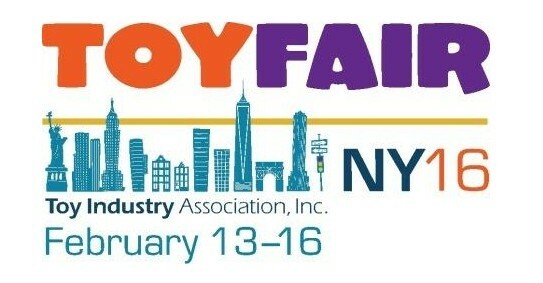 On Monday 15th February, we spent a fantastic day at the New York Toy Fair 2016. 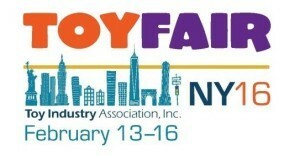 The event was hosted in the spectacular Javits Centre in Manhattan. It was a great day and we met lots of companies who were interested in discussing Taxi with us. Lots for us to explore and follow up on now we are back and the New York version of Taxi was very well received. 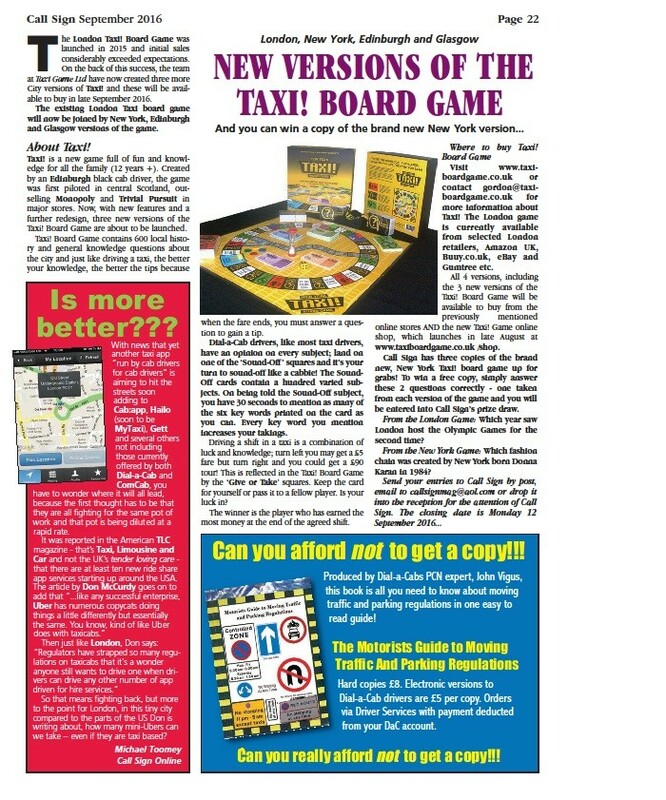 Radio Taxi’s, part of the Mountview House Group, have run an article and a competition supporting the London Taxi board game in the December edition of their company magazine. Go to page 17. Esdevium Games now distribute Taxi! We are delighted to announce that Esdevium Games, a UK-based distributor of games and toys both domestically and across Europe, has agreed to distribute the London Taxi! board game. This partnership should ensure that Taxi is available in a wide range of retail outlets across the UK. In 2010 Esdevium Games became part of the Asmodee Group with offices across Europe, the USA and Asia. If you are a retailer and you wish to discuss stocking Taxi! please contact Esdevium. Contact details are here. The September issue of Call Sign Magazine – Dial a Cabs monthly magazine – includes a special London Taxi board game READERS OFFER. Available throughout the month of September it offers readers a £7 discount when purchasing the game via Amazon. The readers offer can be found on page 20 – right next to the article on ONE DIRECTION. 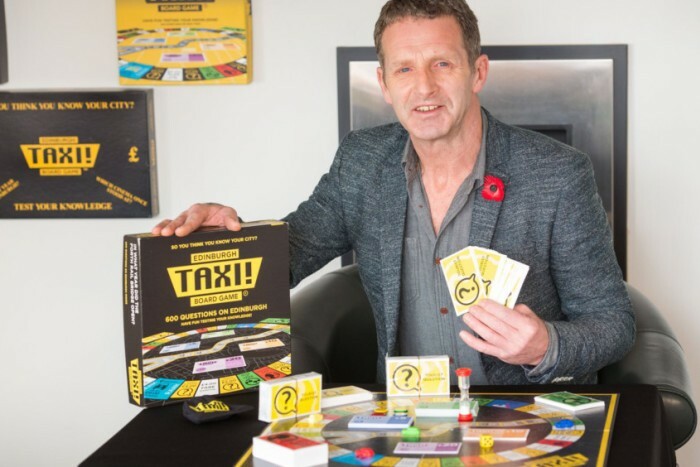 If you would like to find out more about the new London Taxi Board game please click here OR if you wish to buy the game via Amazon please click here. Taxi Globe is a well established, independent taxi trade newspaper. Every fortnight this free newspaper is distributed to London’s world famous black cab trade within the boundaries of the M25. The latest edition of Taxi Globe was released today, 19th August, and on page 13 there is a competition promoting the new London Taxi! board game. If you would like to purchase the game please click here or alternatively to find out more about the game, please click here. 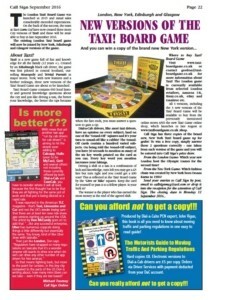 The Licensed Taxi Drivers Association newspaper – Taxi – has included a competition on Page 8 of their latest issue to promote the new London Taxi game. To buy the game please visit our page on Amazon.